Lock in a great price for Prince Cyril Hotel – rated 8.4 by recent guests! Very nice location. Quite street. Very good for adults who wants to enjoy their time with the family. We enjoyed our 2 nights stay. The view from the terrace was very nice. Even if we arrived late, we were able to check in without any problems. We would stay here again! 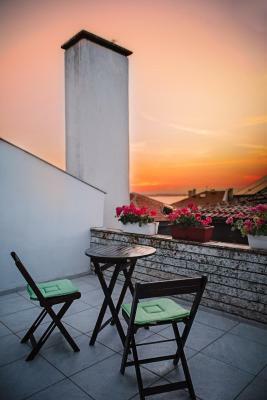 The hotel is located in the old town, and if you are for a comfortable hotel then it is not the right place to stay, although, it was very convenient to relax on the seaside and enjoy old town without travelling. Our apartment had a nice view of the sea. The view from the last floor was superb, room was enough for two persons, with comfortable bad, refrigerator and air conditioner. The location was good, 5 minutes walk from the big left parking of the town and few steps to the center. Personnel was kind and helpful. Great location, we had a room in the mansard on the top floor, the room was quite small and basic but we had a big private terrace with sea view, so it was really nice. The hotel sits a few minutes walk from the main area of Old Nessabar Town, so is VERY near the restaurants and sights of what this beautiful old World Heritage Site has to offer, but be aware...Nessabar is NOT disabled friendly, elderly friendly or friendly to parents with children in strollers. 75% of the streets are cobbled and are dangerously uneven...trip hazards are EVERYWHERE. So extreme caution is needed. The owner of the hotel is wonderful and super friendly...she even presented me with a small gift for being her first customer of the season. I can only wish her every success. Highly recommended...but watch out for those uneven streets. The hotel is located right in the city center, very close to the beach and, in general, to the terraces where you can serve traditional dishes, fish or seafood. Wifi signal very good in the rooms, nice and friendly reception. The staff was very friendly. We hat a lot of space in our room. The house was very clean and quiet. 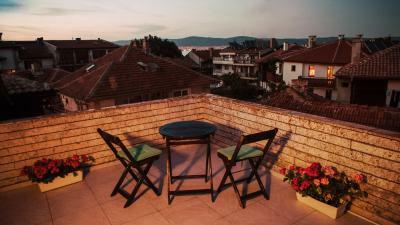 The Hotel was situated in the old town of Nesebar. We liked everything. Prince Cyril Hotel This rating is a reflection of how the property compares to the industry standard when it comes to price, facilities and services available. It's based on a self-evaluation by the property. Use this rating to help choose your stay! 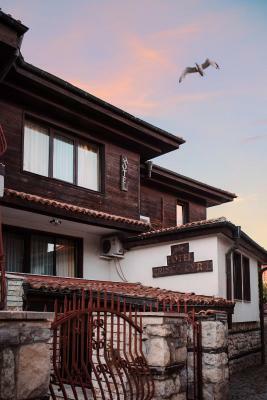 Prince Cyril Hotel is set in the center of the ancient town Nessebar, 650 feet away from the shores of the Black Sea. Free Wi-Fi is available in all rooms. Each air-conditioned accommodations has a flat-screen TV with satellite channels and a mini-bar. The private bathroom comes with a shower. Some of the rooms feature a balcony. Hotel Prince Cyril has a front desk with a safe. The Old Town of Nessebar features many historic churches. Ruins of the former city walls can also be seen there. Sunny Beach is only a 13-minute drive away. When would you like to stay at Prince Cyril Hotel? Public parking is available at a location nearby (reservation is not possible) and costs BGN 4 per day. This family room features a electric kettle, flat-screen TV and sofa. House Rules Prince Cyril Hotel takes special requests – add in the next step! All children under 12 years are charged BGN 5 per night for extra beds. Please note that the total price of reservation is payable directly upon arrival in BGN. Please inform Prince Cyril Hotel of your expected arrival time in advance. You can use the Special Requests box when booking, or contact the property directly using the contact details in your confirmation. There were not protections against moskito at the Windows,. Problems with parking. No breakfast included in the price. Also, the bathroom was not well organized, there was no curtain(s), and when showering water is everywhere, everything is wet. 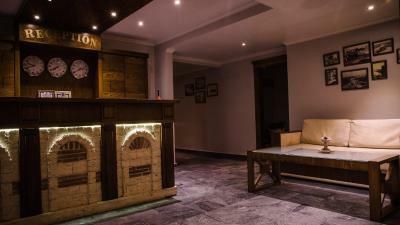 The hotel is not a modern and trendy one, although it is located on one of the central streets of the old town. It is a relatively ok hotel if you are not very pretentious about how the rooms look. Being at the last floor, mansard room, is was a little too hot in the night and we can not sleep with air conditioner on. On the roof and outside the gulls were annoying with their noise. So better ask for low level floors when booking a room if you don't want to care about this two problems. Also some new arrangements in the bathroom would be nice, new toilet seat, bathroom door must be replaced. More attention to cleaning in the room also would be a plus for the future.